For a few months now, my husband and I have been drinking Kombucha. What’s that you ask?! It’s a magical elixir! It’s basically a dose of good bacteria to make things right in your body. It detoxifies, balances, and makes you feel so so good. 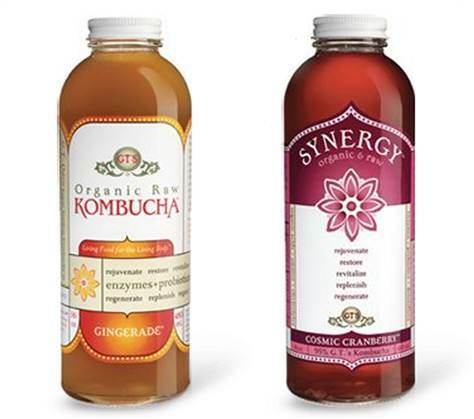 There’s claims that the guy who made GT’s Kombucha, gave it to his mother who had breast cancer and it helped her fight it. Who knows if these claims are true or not. I’m not saying it will cure cancer. My friend told me she had been drinking it through her pregnancy and she swears by it. So I thought we’d give it a shot. First we shared a bottle once a week and now we have a whole bottle once a week. I read a lot of reviews about this stuff, and mostly people complained about the smell and flavor, but honestly I don’t really notice anything. It smells like vinegar and tastes like whatever flavor it is. I like the berry ones and the ginger one. There’s bacteria colonies floating around in it so you shouldn’t shake it violently and it is effervescent. I suppose if you’re a finicky eater you probably won’t enjoy this stuff, but I like it. I’ll try anything a couple of times. I’ve noticed I have more energy, I feel cleaner from the inside, and I’m super regulated. I feel the balance. If anybody is a raw foodist, then you can drink this, it’s totally raw. I’ve heard of the pasteurized kind, but that makes no sense to me. Pasteurizing kills the bacteria, so I don’t see how that would be effective. The drink contains probiotics and powerful antioxidants. I’ve also noticed my skin has a glow through the week. It’s low in calories and sugar and is great as part of a cleanse. So don’t be a pansy! Just put your big girl underpants on and take a swig, you’ll feel amazing!